Design by Kimberly Glyder Design. Jesus that's so boring and safe, for a supposedly non-conventionlal book. Cover is credited to Kimberly Glyder Design. I think I might've tried making it look somewhat beat up and torn at the corners as though it was the last one left on a shelf. Maybe that's boring and safe. No great ideas. Eh. Not so interesting of a cover, but but your description would make me avoid it anyway. Sounds like this author is trying to get around actually having any talent for either plot or narrative. Here's how one person accomplished virtually the same brief. There's many Kimberly Glyder's covers I like more than this. She never comes out with what we would usually tag as IDEAS. It seems the book neither does it. Hope cover makes justice with its content. But finally, I think it's not a bad cover at all. I like that it has a very clean look. If it was worn and such I would find it boring, done before. This has a very graphic feel that I like and doesn't need to be compromised. 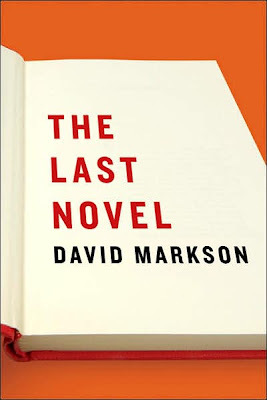 While I am not a huge fan of this design, I think it is better than many of Markson's other novels in that department. Unfortunately however, I would rank this among the weakest of his novels on the page; it is the only one where his own voice comes through too strongly, his own ego shows too obviously -- it comes off as sort of absurd, this desire to be recognised for his work, in the context of a career made in part by cataloguing the widespread failure of artists to be acknowledged by critics and society at large. I am a huge, huge fan of Markson, but if you are going to read one book of his, make it Wittgenstein's Mistress. I like it. The perspective on the text looks a bit wonky I like that too- also I like the fact that it looks like an idea rather than a finshed work. Is that be a good thing? Why not. It begs the question 'how would you change it'? This book cover aside. I have just discovered this blog and I love it. May you who does the main stuff be showered with good fortune, lovely prezzies and heaps of worthwhile engagement. As my friend Itu always says Never judge a cover by its book! I have the book, and to be honest didn't realize there was a book on the cover. I think a more fitting cover would have been a 3X5 card with Markson's name printed at the top last name first.